There are plenty of exceptions though, including some cities that don’t immediately come to mind. For tourists heading to sunny and warm Florida, Fort Lauderdale is a vacation spot where you can get around easily without your own wheels once you’ve checked into your hotel. I was just in Fort Lauderdale while attending the TBEX (Travel Bloggers Exchange) conference for North America. About 700 of us descended on the city and were spread out all over in different hotels. I took the opportunity to research the transportation options and came away happily surprised. Here’s how you can explore Fort Lauderdale on your own. This is not the cheapest or fastest option, but it’s certainly the most fun. You board at one of 17 stops along the Intracoastal Waterway, the inland passageway that stretches along much of the southern Florida coast. 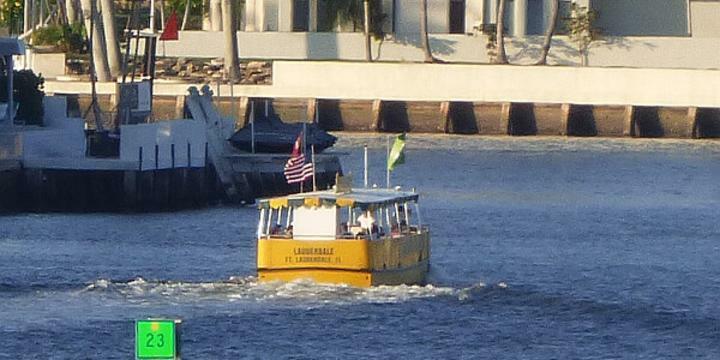 The Water Taxi goes from 32nd Street in Fort Lauderdale to the Las Olas shopping area downtown and then all the way down to Hollywood—last stop Crowne Plaza Hollywood Beach. One stop before all that is a block from the convention center and near the cruise port. This is more a sightseeing trip than a way just to get around and is priced accordingly. It’s $15 after 5:00 p.m. but $25 adults/$11 children the rest of the time. This is for a day of unlimited rides though, so you can get on and off as much as you want and use it for a round trip or a day of exploring different areas. There are bars and restaurants by some of the boat stops, so you could even fashion your own waterfront pub crawl. If you’ll really be using it a lot, a three-day pass is $61 or you can move here and ride all year for $225. The trips are a lot of fun because you get to see all the crazy huge mansions with their oversized yachts owned by the one-percenters who gravitate to this kind of place. There’s some fun history from a guide, who points out where Lucille Ball, Leonard Nimoy, Sonny & Cher, and others have lived. The showiest places are from company founders of the likes of Hooters, Pillsbury, Doubletree, and the company that makes scratch-off lottery tickets. (Lesson there: If you want to get rich, don’t play the lottery—be a lottery ticket maker.) See more and buy advance tickets at WaterTaxi.com. The Fort Lauderdale Sun Trolley is a series of seven routes that covers not just the beach road, but also neighborhoods, downtown, and a connection to the airport bus. There are two great reasons to go for this option: price and convenience. On the price side, the airport link is free and the two trolley routes that have a charge—Las Olas and the beach route—are only $1 for a ride or $3 for an all-day pass. Where else in a U.S. city do you find prices like that? On the convenience side, you don’t have to wait around for a half hour not knowing when the bus will show up. There’s a Sun Trolley app you can download that will show you in real time where the buses on your route are, via GPS. See more at SunTrolley.com. Fort Lauderdale is a great city for getting around by bike. Very few of the hotels are actually on the beach, so a bike ride along the beach road provides water views the whole time. There are bike lanes on the streets you’re most likely to travel on elsewhere too when you head inland. You don’t have to rent one from a bike shop though. The Broward County government maintains a public bike share system where you can pay for a half hour ($5), a seven-day pass ($25), or an annual pass ($45). It’s easy to find a bike stand in the tourist zones and the checkout process is simple. I paid with a credit card and after entering my mobile number, got a text of exactly when I took the bike out and another one after I returned it. These are comfy cruisers with a basket, but they have gears in case you need to cross the big drawbridge over to the convention center like I did. See more at the Broward BCycle website. I took two rides with Uber, the ride-sharing service, at night after a few drinks. Both were under $6. If you don’t have data service though, you can probably remember this local taxi company’s number: (954) 777-7777. This isn’t transportation in the traditional sense, but it’s a way to sample a lot of craft beer in one go without anyone getting behind the wheel. I’ll do a full post on this fun brewpub tour in a week or two. There’s one each in Tampa and Jacksonville too. See BrewBusUSA.com. For info on what to do in the area, check out the Fort Lauderdale Tourism website. They have one of the greatest domain names ever: Sunny.org.